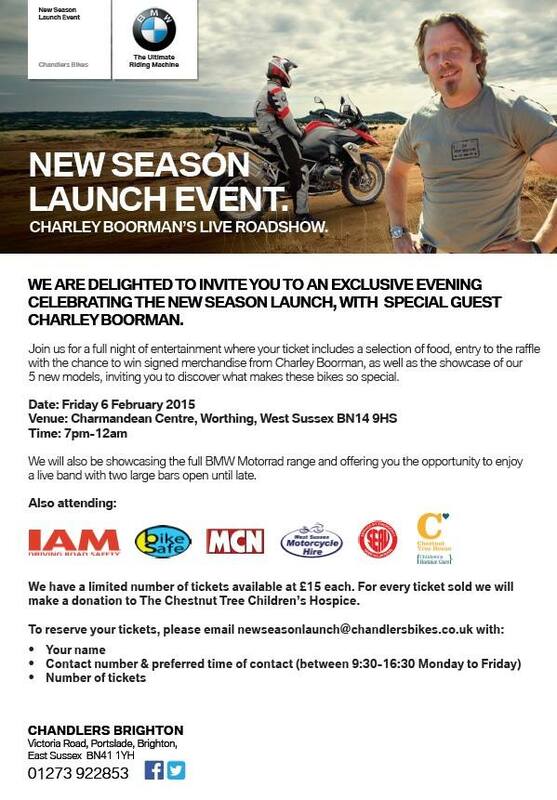 Guys, we’re excited to announce that you can come and see Charley’s Live show presented by Chandlers BMW in Worthing at the Charmandean Centre in Worthing. It’s on Friday 6 February as part of the Chandlers Bikes new BMW Motorrad models launch. There will be prizes, Long Way Round merchendise and a signing and photo opportunity with Charley – not to mention, food, a band and beer! Tickets will be available from Friday 9 January at £15, (ticket price includes a contribution to charity) Please call 01273 426600 or email newseasonlaunch@chandlersbikes.co.uk to purchase yours.